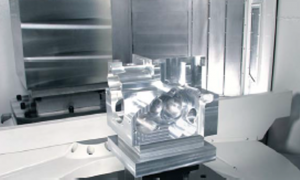 The SUPER VELOCITY CENTER 2000L II Series of traveling column vertical machining centers deliver high speed and effecient machining of extremely long workpieces. 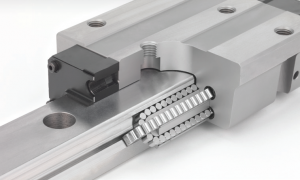 Linear motors provide high-speed super-fast X-axis rapid traverse speeds to reduce non-cut times. These machines are especially well suited for long aerospace parts. The machine features traveling column construction with a fixed table. 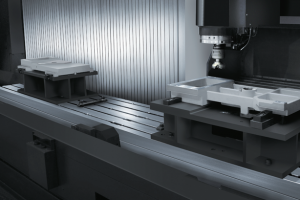 Thanks to the long table, long, large workpieces can be easily machined. The table can also be utilized for loading more than 2 workpieces and used like a 2 pallet changer. The X-axis linear motor drive provides high speed positioning with a rapid traverse rate of 120 m/m (4724 IPM) and maximum feedrate of 30m/min (1181 IPM) for improved productivity. Designed for convenient system expansion after the initial system installation from a minimum of 1 machining center, 1 loading station and pallet stocker with pallets. The pallet stocker modules are available in single, double, or triple levels.